With all the excitement about Tony TNT going to court, we let is slip past us the #1 Hack Guru Brad Huebner and his BH Group who were indicted last year and originally accused of stealing over $38 MILLION U.S. Dollars from Dinarians with a “hedge fund” scheme! HaHaHa, Finally BH Group go to Trial for their alleged crimes against the Dinar Community! Look out Tony TNT, you’ll be next!!!! Here is an excerpt about Brad’s trail from the BLADE! Emmenecker, Huebner, Teadt. Emmenecker, Huebner, Teadt. Crooks or businessmen? That’s what a jury will have to decide in the next few weeks as the trial of three area men charged in a $23 million fraud scheme unfolds in U.S. District Court. The trio is accused of selling Iraqi currency, the dinar, and placements in two nonexistent hedge funds using false statements to lure investors. Charged in the alleged conspiracy are Bradford L. Huebner, 66, of Ottawa Hills; Charles N. Emmenecker, 66, of Sylvania, and Michael L. Teadt, 67, of Maumee. In his opening statement to the jury Tuesday, Assistant U.S.
Attorney Gene Crawford held up a 25,000 dinar note worth that he said is worth about $25 in U.S. dollars. It is not illegal to exchange dinars for dollars or sell it for a fee, but Mr. Crawford said the defendants broke the law when they lied to sell $23 million in bad investments. Mr. Crawford said the defendants promoted the currency as a potentially profitable investment on the theory that at some unknown point in time a “revaluation” would occur. If the Iraqi government would increase the value of its currency from a tenth of a penny to, say, $2, a $25 investment could turn into $50,000. He said the BH Group, a Toledo company started by Mr. Huebner to sell dinars, used a number of false statements to promote investment in dinars and in two related hedge funds, including the contention that a member of their group was wounded while fighting in Iraq and that the U.S. Treasury held a large sum of dinars. From Mr. Huebner’s office overlooking Fifth Third Field in downtown Toledo, the company would hold regular conference calls to lure investors, Mr. Crawford said, relying heavily on the “expertise” of Rudolph M. Coenen, a co-defendant from Jacksonville who pleaded guilty last year to conspiracy to commit wire fraud, wire fraud, and five counts of money laundering. Rick Kerger, who represents Mr. Huebner, told the jury that it was Coenen who sold Mr. Huebner on the hedge funds then spent all of the proceeds. Attorneys for Mr. Teadt and Mr. Emmenecker also told jurors that the men were duped by Coenen and invested their own money in the scheme. 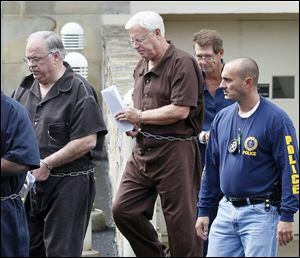 Mr. Huebner, Mr. Emmenecker, and Mr. Teadt each are charged with conspiracy to commit wire fraud and wire fraud. Mr. Huebner also is charged with mail fraud and multiple counts of money laundering and structuring transactions to evade reporting requirements, while Mr. Teadt also is charged with mail fraud, three counts of structuring, and one count of making a false statement to an IRS agent for allegedly saying he never sold dinar. Testimony is to begin at 9 a.m. today before Judge Jack Zouhary. Contact Jennifer Feehan at: jfeehan@theblade.com or 419-213-2134. Well, Starting May 6th, according to the U.S. Department of Justice website, Brad and his chronies started their court trial. United States v. Bradford L. Huebner, et al. The Court has designated this case as a “Multiple Crime Victim” case under the provisions of 18 U.S.C. §3771(d)(2). Status updates and notices of scheduled court proceedings will be relayed through this website. General information for victims of federal crime is also available on this website under the link for the Victim-Witness Assistance Program. Status conference as to Rudolph M. Coenen. Sentencing set for 12/16/13 at 2:00 PM vacated. Sentencing to be reset at a later date and time. Criminal charges in the case which involves defendant(s): Bradford L. Huebner, Michael L. Teadt, Charles Emmenecker were dismissed on November 28, 2013. Since the charges have been dismissed, the trial previously scheduled on December 2, 2013 has been cancelled and there are no longer any bail restrictions on the defendant’s release. Indictment returned as to Bradford L. Huebner, Charles N. Emmenecker and Michael L. Teadt. Case assigned to United States District Judge Jack Zouhary. All scheduled hearings will take place before United States District Judge Jack Zouhary, in Courtroom 204, United States Courthouse, 1716 Spielbusch Avenue, Toledo, Ohio. If your attendance is required, a subpoena will be issued for you. If any lawyers out there have access to the case files, and wishes to share it, I will protect your identity, send it to me using the email address supplied in my MailBag. This entry was posted in Brad Huebner - BH Group, Hack "Gurus", Hedge Funds, Investing Products, Rudy Coenen - Bayshore Capital and tagged BH Group, Brad Huebner, Charles Emmenecker, Court Docket No. 3:12CR443, Dinar, Iraq, JENNIFER FEEHAN, Michael Teadt, the blade, Tony TNT by MrIQD.com. Bookmark the permalink.